Recently, I polled people from around different support groups and pages to ask their advice on what they did when they first realized that they had GP/DTP. I asked, "if you could give anyone advice who was newly diagnosed, what would it be?" I got some overwhelming responses. I'm going to type first names because I don't want to give away the privacy of the people giving the advice. 1. I started a blog to keep track of my medical information but also to help others. 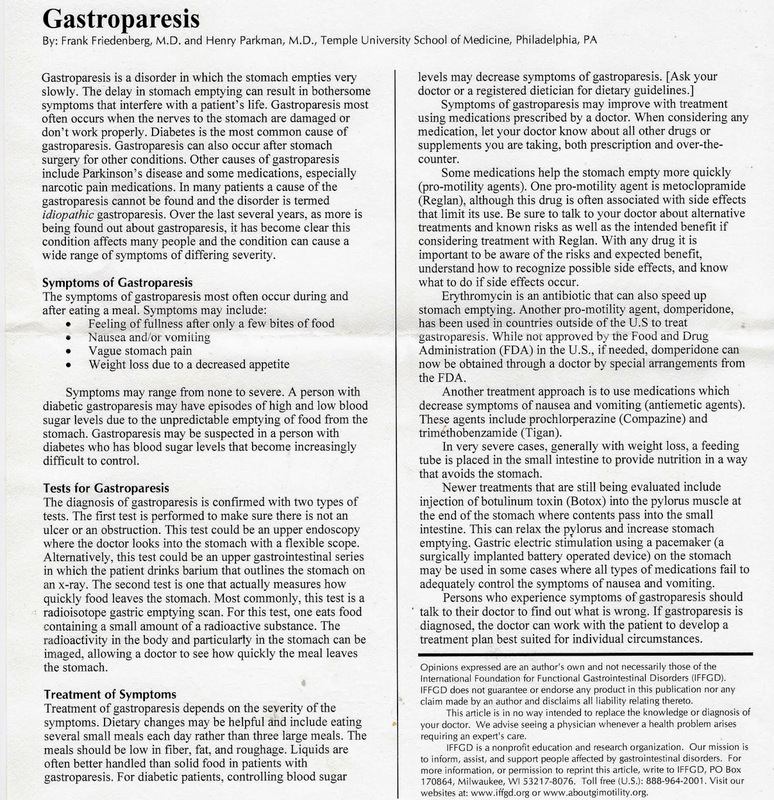 When I was first diagnosed, I didn't know what gastroparesis was and there was barely anything online to explain it to me. I compiled my research to put into this blog and helped people that way. My blog today is used as a resource for United Healthcare, for when they get new GP patients. 2. I purchased a journal. While this may sound silly, I carry this thing around with me everywhere, and I do mean everywhere. I do daily entries to log what I eat, what time, when my gastric spasms start, when I get sick, how much I get sick, and how I feel. I also take pictures of my swollen belly after I eat and post those pictures in my journal. I print out and post motivational things in there too. There is also an app on your phone called "My Symptoms." It's $2.99 in the Google Play market but it will keep track of food, drinks, medications, and bowel movements. I use both because you can't be too safe. Also, the "My Symptom" application can be download into a spreadsheet to show your doctor. You can also give your written journal to your doctor. Maybe make a copy of it beforehand? It gives your doctor an idea of what you're going through. It will also help distinguish patterns. 3. Be your own advocate. Keeping the journal is well on your way to becoming an advocate for yourself. Do your own research and prepare questions in advance to ask your doctor. That way, you won't forget what you want to ask him and you can maximize the use of your time together. 4. Believe in yourself. This is hard sometimes. It's hard to keep going but just remember that you're a strong person, you've gotten this far. Things will be all right. Keep on believing in yourself and others believe in you, too. 5. This rule goes hand in hand with 3. Ask questions! If you can think of anything, write it down and bring it with you to the next doctor's visit. If it's an emergency, call your doctor after hours. 6. Research your condition and your doctors. Not all GI doctors are created equal. 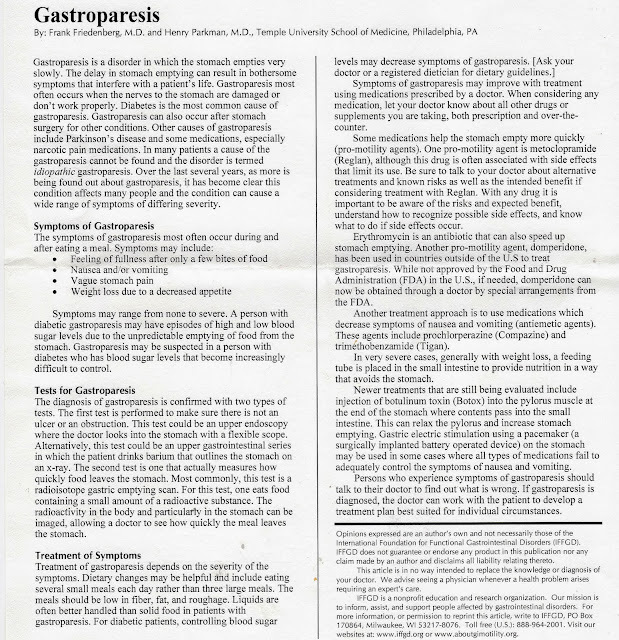 The newest one I just saw told me that gastroparesis does not cause pain. So, keep searching until someone believes you. 7. The GI Doctors at Mayo recommended cannabis, where ever it is legal. If you use cannabis, use it responsibly. 8. It's NOT *ALL* IN YOUR HEAD! I cannot stress that enough. I've been told that half of my life. The Spoon Theory helps with teaching those without a chronic illness what it's like to live with a chronic illness every day. It's rough but this is the most effective theory I can think of. 9. Stay strong by finding a support group. If you need help, you can read my blog or join any of my groups of Facebook. We are all here to support one another. If you look in your local paper, you can probably find public meetings for those with chronic illness. Just talking to people who understand where you're coming from is like a burden lifting from your shoulders. 10. Don't give up! We all have rough patches that knock us down but we get right back up keep fighting. We're strong, especially all united together. Lean on others for support when it becomes too much. That's why we're there. 11. Stay positive! I preach this nonstop because it is important to your health. If you get too stressed out, then your immune system is compromised. Try and stay positive and calm. 12. Be patient. While there is no cure for GP, we have good days and we have bad days. If you are having a "GP Attack" because be patient until it passes. Work on deep breathing (it's in my blog in another article). Also, try and stick to the GP diet. Stay away from things that are hard to digest like fiber, gluten, some raw fruits and veggies. 13. Stay hydrated! If you let yourself get dehydrated, that brings along a whole new set of problems. Dehydration can cause dizziness, headaches, and fatigue. If it's severe enough, you'll need to go to the hospital for IV fluids. Even if you're vomiting, try and such on some ice chips and sip on Pedialyte. 14. Take liquid vitamins or vitamelts. I am currently dealing with a vitamin deficiency, which is common for people who suffer from GP. My body is malnourished and quite starved since I can't hold down food, even if I wanted to. Dehydration just digs you into a whole that you can't escape from. You can try Flinstone's vitamins, or the melt away vitamins. 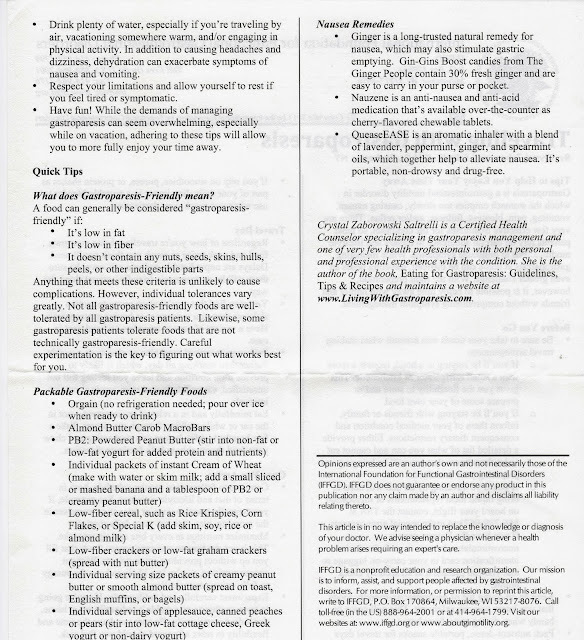 Stay away from the gummy vitamins! They are hard to digest. 15. Lean on family and friends. I know some people have families who aren't very supportive and I'm sorry. They probably don't understand what you're going through but keep your chin up and help them to understand. My favorite is called The Spoon Theory and I've found it's the most effective when explaining a chronic illness to those who don't understand. Keep in mind that family doesn't always mean blood relation. 16. If you are religious, prayer can help. You can also seek out emotional support from a church congregation or a priest to help you get through the initial shock of, "Oh no! I have gastroparesis and now what I am going to do?" You have a community who cares about you and they want to help you. They just may not always know how to help. You will have to tell them how they can help. 17. Keep Yourself Happy. I cannot stress this enough. Being upset does nothing to help your stomach and the stress will more than likely make your stomach worse. I can attest to this from personal experience. HERE is a list from a previous article that gives lots of ideas on what you can do to keep happy and distracted. 18. Keep looking until you find the right GI doctor. I've been told GP doesn't hurt - but if nerve damage hurts in the rest of the body, why not the stomach? I had a doctor at Mayo tell me it was all anxiety because did didn't want to treat me; I was too complicated of a case. Don't forget that these doctors work for YOU. Keep searching for a doctor that's right for you. Find someone you can trust and who will listen to you. I've gone through about 10 GI doctors here in Atlanta and I'm still looking for the one who will listen to me. 19. Don't be in Denial. We all go through it. It's almost like a grieving process when you hear you have GP. I've eaten fast food because I was starving. But, I shouldn't have done that. A few times I did think the GP was in my head and then the vomiting and the gastric spasms (they feel like you have a charlie horse in your stomach when they start). Don't torture yourself and follow the GP diet. Eat low fiber,no raw fruits or veggies, and try and stay away from gluten. 20. Take advantage of the good days. Good days can be few and far between. So, take every minute of every day and enjou it! Who contributed to the ideas in this article.